Dunoir Fishing Adventures has been very busy on the rivers and lakes. This past weekend we were guiding on the Bighorn River in Thermopolis, and we had the wonderful opportunity to work with the beautiful ladies with Casting for Recovery Clinic in Dubois, Wyoming. This clinic was definitely the highlight of our summer guiding! 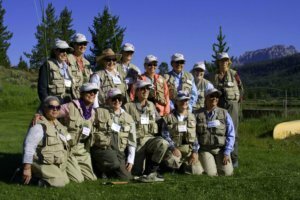 It was an honor to take part in Wyoming’s first Casting for Recovery clinic, and to work with an amazing group of fly fisher women! Thanks to Mary Turney for organizing such an amazing event. Fishing Report: We have had boats on the Bighorn River for the past four days, and the fishing is shaping up into its old form. Spring runoff has FINALLY subsided and river flows have dropped down to 1660 cfs. Nymphs, streamers, and terrestrials are all working. Fishing…lights out! Call 307.349.3331 to book your trip today! New Boat & New Waters! We have just added a new boat to our fleet, a StreamTech Green Drake 13 foot fishing raft perfect for those hard to reach waters. We gave it a test run yesterday on the Wind River below Boysen Dam and I must say I am flat-out impressed. 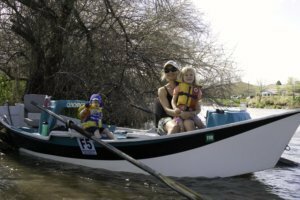 This boat handles as well, if not better, than the drift boat on more technical waters, and it feels extremely safe in eddy lines, rough water, and holding anchor. Another addition for Dunoir Fishing Adventures is our newly permitted access to fish Boysen State Park below Boysen Dam on the Wind River at the head of Wind River Canyon. This section of river has fantastic scenery and HUGE Browns, Rainbows, Cutts, Walleye, and Catfish. This section of river mixed with the Wedding of the Waters in Thermopolis will make for a fishing trip of a lifetime. Call to book your trip today at 307-349-3331. It has been a pretty amazing summer for fishing, weather, and waters. Some of the high mountain lakes around Dubois have just iced-off. Who would have imagined? The fish are happy, hungry, and glad to see some blue sky. We are excited about insects hatching and dry flies are starting to produce fish. The mosquitoes are out and so is the bug spray. We are waiting for the grasshoppers and terrestrials to grow bigger and the trout start slamming them. Soon. The Bighorn and the Green Rivers are still flowing above 5000 cfs. Remeber, big waters…big fish. 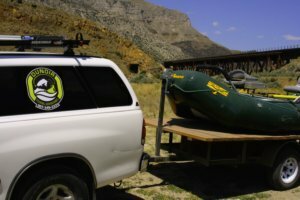 Dunoir Fishing Adventures is picking up a new StreamTech Green Drake fishing raft this next week, which will be great for the upper Wind River near Dubois and many other waters that we could not reach before. Big things are in the works for us and we will announce it soon. Keep posted. To book a trip with us, call 307-349-3331. The water flows on the Bighorn River in Thermopolis have drastically dropped. Last week, flows were around 5000 cfs and today they have dropped to 2490 cfs. We fished the river two days ago at 4000 cfs and it was outstanding. We are kind of bummed that the flows are dropping because it is so much fun flushing the big fish in big waters on big bugs. We caught numerous fish nymphing annelids and throwing big streamers. 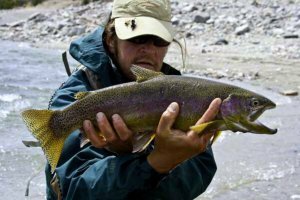 The fishing should remain good to excellent as the flows drop. Dry fly fishing coming soon! In addition to the Bighorn River, the Wind River remains blown out near Dubois. Some of our key mountain lakes on the Shoshone National Forest are finally icing off, which is a great time to fish them. Full guide season has started and we have been busy. To book your trip, call 307-349-3331. We will work hard to put you on the fish and provide an enjoyable fishing experience with our knowledgeable and personable guides who have fished the area for well over 26 years. Summer has finally hit the high country in Wyoming and big river flows are being reported around the state. The Wind River near Dubois is at high water mark and completely blown out. However, lower down on the river at Wedding of the Waters, where the Wind River becomes the Bighorn, water levels are dropping and the fishing is excellent right now. We have a trip tomorrow on the Bighorn and will be reporting back. Keep posted. Even in high water flows and runoff, there are plenty of waters to successfully fish. Book your trip today at 307-349-3331. We spent a few days fishing the Green River on Seedskadee National Wildlife Refuge this last week with guests and for ourselves. The flows are up to 4600 cfs and will probably continue to rise. Summer fishing on the Green River has finally arrived. Baetis nymphs and BWO’s were abundant and expected with the cloud cover and warmer temperatures. Nymph and streamer fishing have been very good with the big water flows in the soft pockets. Yesterday, we boated this 26 inch Brown and a 24.5 inch Rainbow, but probably lost the largest fish of the day on a snapped line. Our boat landed Browns, Yellowstone Cuts, Rainbows, and White Fish. It is nice to have some warmer weather and really enjoying the big river fly fishing in Wyoming. I think the Green River will be fishing for a while to come as long as the water temperatures remain cool during July. In addition to fishing, we have seen several bald eagles, raccoons, blue herons, and the fish eating pelicans. What is not to love fishing in Wyoming? 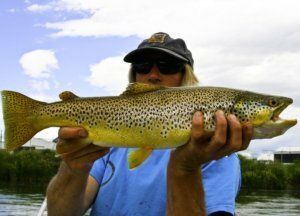 Jarrod Johnson with a fine specimen of a Brown trout caught on the Wind River! We had another fine day on the Wind this Wednesday catching two huge Browns. Once again, big streamers were the ticket for pulling the big fish off the banks. Our weather is finally turning into summer-like conditions and the waters across the state are flowing large. No worries though because big waters equal big fish! Reports on Wedding of the Waters and the Bighorn have been fantastic too. Remember to watch for those river flows stabilizing and watch the weather for clear conditions. We are headed for the Green River on Seedskadee National Wildlife Refuge this next week, so keep posted. 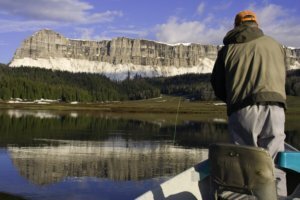 NEW Website Update: We have added a link to Wyoming Weather Forecasts to help you plan your next fishing adventure. To book your trip today call: 307-349-3331. Fly fishing on the Wind and Bighorn Rivers have been fantastic lately! Big water flows, big bugs, and BIG fish! We had a great day yesterday with several large fish caught on big streamers. Fish are holding in soft waters and pushed up against the banks. 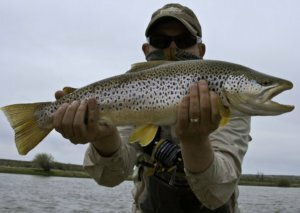 Our high water flows are not disrupting the fishing too much, and with the right timing, fishing has been very productive. 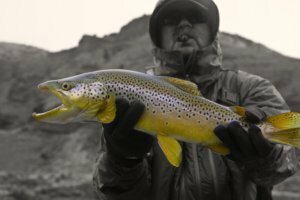 Warm and dry weather is on the forecast, and we are fishing one of the great Wyoming tail-waters in two days. Keep posted and if you would like to book a trip of a lifetime, give us a call at 307-349-3331. Spring has finally arrived in Wyoming. Many residents are concerned about flooding with our large snow pack (200% of average). All of that snow has to melt off and go somewhere, and that is in the rivers and streams that we fish. Flows in the rivers have been increasing across the state with our warmer weather and recent precipitation. The Bighorn River is flowing at 4240 cfs and has been muddy below Buffalo Creek lately. Wedding of the Waters has been clear with moss. Once the flows stabilize and Buffalo Creek clear, the river should be fishing very well. The Green River has been steady at around 3000 cfs and was slightly bumped to 3520 cfs last week. We are excited to see how that will be fishing this next week. Spring flows do not end the fishing. We have many lakes, river runs, and other tricks up our sleeves to find the trout. The trick is watching the weather and the water flows (found on “Waters We Guide” sections on our website). Rain and spring weather forced Scott “Piscator” Urbanski and I off the Bighorn River on Saturday. Reports indicated that the river was high and muddy. My family and I floated today (Sunday) and we can confirm that the river is still muddy. Give it a few days and it should be back to normal if we do not get more rain or snow. Scott and I decided on Plan B and to fish near Dubois, Wyoming. It was the right choice as the weather in the morning was beautiful. By the afternoon, we pushed lines through 40 mile per hour winds. Scott represented his name as the “Piscator” catching a beautiful large Brown and this 20 plus inch Rainbow trout on a streamer. New Website Features: We have added a few new features to our website. Within each section of “Waters We Guide,” visitors can find live updates of the water flow (CFS) on each river. 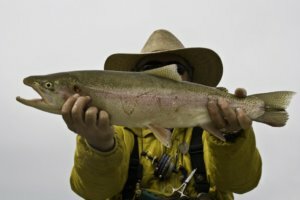 We have also included links to purchase Wyoming fishing licenses and Conservation Stamps on our Rates page & Links. 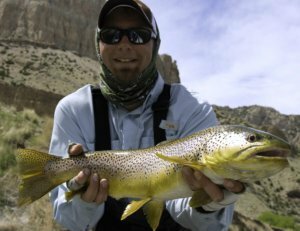 We hope these features are helpful and useful when planning your next fishing adventure to Wyoming.